4 day/3 night vacation. 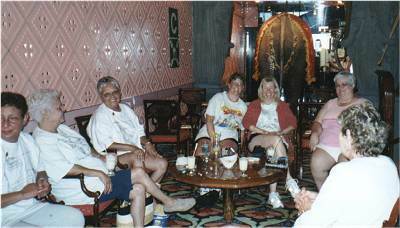 This was the perfect "getaway" and the first time cruising for many of us. 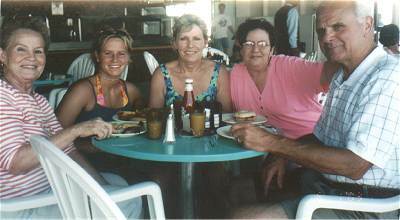 Read about our cruise and decide if you would like to go with us next time! It was great to travel with a group of women who all had something in common! You can also vote for what you would like to see for our next event! 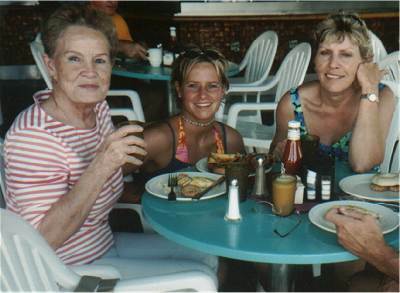 Look at the smiling faces on our cruise! For starters, there's several of our women that didn't make it for the picture....don't ask, just chalk it up to MENOPAUSE! 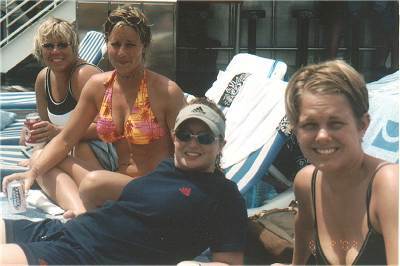 hahahaha....the "condition" was fully present throughout the cruise! I'll be posting more pictures in the days to come as everyone sends me copies of theirs. If you notice that the top row of ladies seem a bit younger, that's because there were lots of mother/daughter attendees, which was fabulous! (My daughter is at the top of the stairs.) The ages of the entire group ranged from 24-73, but all had their own version of hormonal havoc to contribute to the conversation. 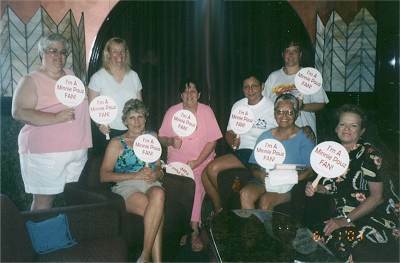 There was actually very little of that discussion though, since we were there for a relaxing vacation with a great group of women! If you can't quite see what we're holding (blame it on the photographer! ), they are fans I handed out that say, "I'm a Minnie Pauz Fan". 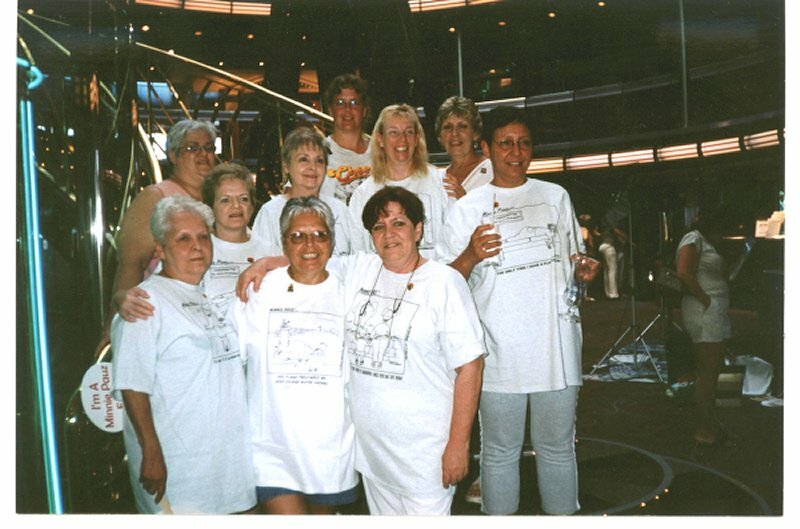 They made quite an impression on everyone from the dining room waiters to the MC of the stage show to other women on the ship who weren't in our group, but were very grateful to be handed one right in the middle of a hot flash! 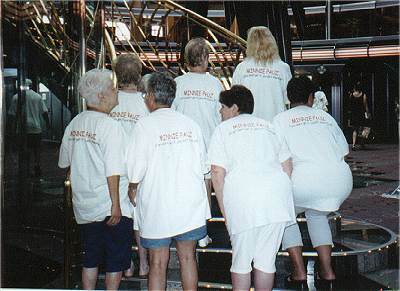 Most of the bottom row are wearing their Minnie Pauz tshirts I gave them as just one of their gifts for being on the cruise. The other gifts included a book titled "Female and Forgetful", a handy "cooling" necktie, a card organizer that holds a year's worth of greeting cards and helps us remember those important birthdays, etc., and a personalized, autographed copy of the cruise cartoon. 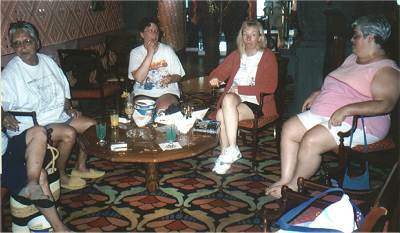 Everyone had their own kind of fun...for some it was the ship's casino, for some it was the food and being waited on for 4 days, for some just getting away from the "real world"......for me it was being able to travel with women I have been communicating with for several years! Well, I enjoyed the food too! (I totally ignored the lowcarb eating I've been doing for 10 months, but with all the walking and stair climbing I did, I only gained about 5 lbs. and I've lost 3 since I've been home). I will be posting more pictures and comments soon so that all of you who couldn't make it on the cruise, will be inspired to make it a priority to attend the 2nd Annual Minnie Pauz MeltDown. As you can see by the poll above, it's starting to look like this one will be on land instead of a cruise. 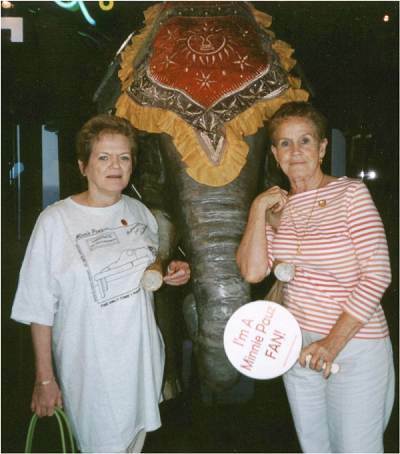 I'm already starting to do some research and hope to have another fun and fabulous event for you in 2004! How does this thing float??? Amazing! "Just wanted to say thanks for giving me the opportunity to take my 1st, but certainly not last, cruise. I had a fantastic time and really enjoyed the group of women and a chance to share some feelings during these changing times. 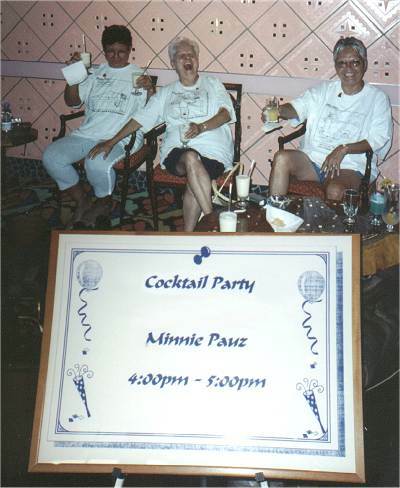 I look forward to hearing more about the 2nd Annual Minnie Pauz trip." 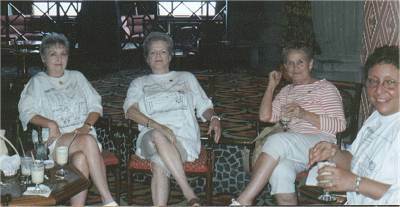 -- Linda H.
"This cruise (my first) was the most fun than I've had in a long, long time! My everyday life just doesn't allow me to spend enough time "with the girls" and to be with women who share so much in common was a real treat! Can't wait for the next get-together!" -- Marcia F.
Now THIS pic really says it all! Be sure to visit CruiseDiva.com for all your cruising information! Highly recommended by Minnie Pauz! lots of other Minnie Pauz stuff, join our FREE newsletter list! !